Should You Put Your Home on the Market on Seattle’s Eastside During the Holidays? We have one of the lowest number of homes for sale and the highest number of sales in the last 15 years! In October, the last month in which we have statistics, there were 1,821 homes for sale, which was 45% less than October, 2011! There were 67% fewer homes for sale than in 2008! October had the most Eastside pending sales (1,202) of any October in the last 15 years! The average number of October sales for the has been 867 home sales, which means this October was 39% higher than the 15 year average! With these high sales numbers, buyer demand is unusually strong for this time of year. There are a lot of buyers out there who are jumping on homes to buy the minute they hit the market. We know because that just happened for one of our sellers. The home was gone in a matter of hours. Because most people don't think it's a good time to put your home on the market, it's exactly the right time to do it. Most sellers will wait until after the first of the year, but there's less competition during the holidays. Buyers are worried they won't find a good home if they wait too long. Buyers are out there and making offers to buy homes. Homes are warm and inviting during the holidays. This is the time of year when people feel like "nesting" at home. A cozy home only supports the feeling. The holidays bring rise to all kinds of homey feelings. Many homes can actually show better during the holidays. 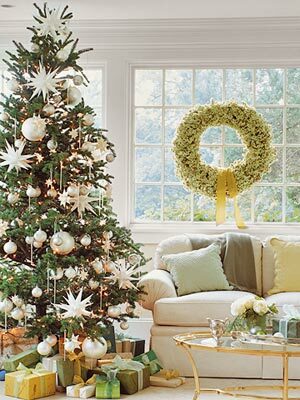 Homes are nicely decorated, making the home feel more warm, colorful, and personal. How Do You Go From For Sale To Sold on Seattle’s Eastside? Moving from "For Sale" to "Sold"
How do you get from “for sale” to “sold?” It’s the price! 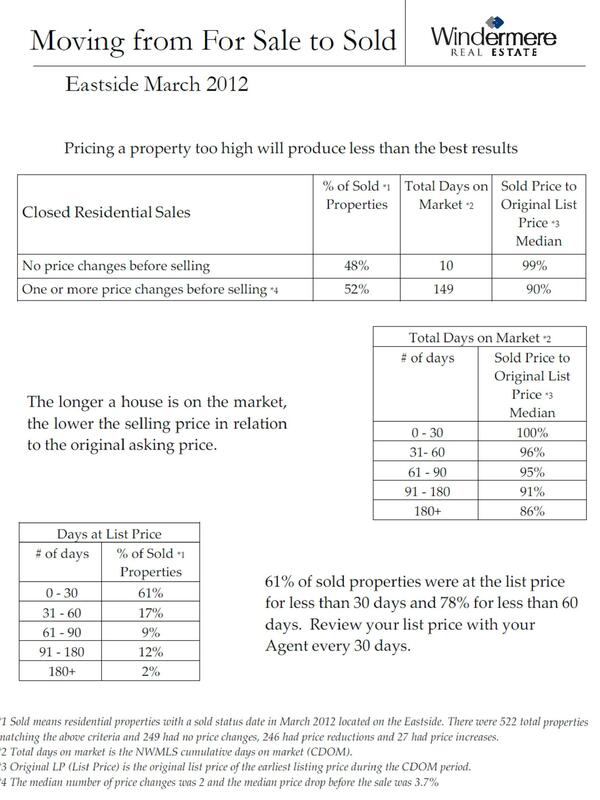 Even though the real estate market in Bellevue, Kirkland, Redmond and other eastside cities is red hot, the price is still critical to getting a “sold” sign posted on the “for sale’ sign in your front yard. Almost half, 48%, of the homes for sale between September, 2011 and March, 2012 sold in 10 days or less! With these homes only on the market for fewer than 10 days, the homeowners and their Realtors did everything right. The homes had to be priced right, show well, have fabulous photos and great marketing or the homes would not have sold. 1. Should you leave negotiating room when you set the price for your home? NO. Some homeowners think they should leave bargaining room. This, however, will send that homeowner down a path toward a longer market time and a lower selling price. Look again at the top line of the first chart. Almost half the homes sold within 99% of asking price and in under 10 days. With sales prices coming in at 99% of the asking price, there was little bargaining in the final sales price. 2. What if you want to price your home high because you’re in no rush to sell? A homeowner who overprices a home will shoot themselves in the foot. Let’s say a buyer is out searching to buy a home and sees 5 homes. The buyer will compare each one’s price, location, and features. They don’t compare whether a seller is a rush to sell or has all the time in the world. The buyer won’t know that. The buyer will only know that when comparing the homes, the overpriced home will stand out. Most buyers don’t bother to make an offer because there are 4 other homes that are more attractive and priced right. There’s no need to waste time pursuing an overpriced home because, even though the supply is low, there are other homes on the market. If today’s market pricing doesn’t meet a homeowner’s needs, then don’t put the home on the market. 3. Were these homes underpriced, because they sold so quickly? No. In today’s real estate market, we’re dealing with very savvy buyers. They know the market and they know pricing. They know when they see a home that’s well priced and they’ll pay for it. The buyers don’t have time to waste. The good homes are going fast. Secondly, does anyone really think that half of the homes that sold in the last 6 months were underpriced? I don’t think so! The other 52% of the homes took 149 days to sell and sold with an average of a 10% discount. 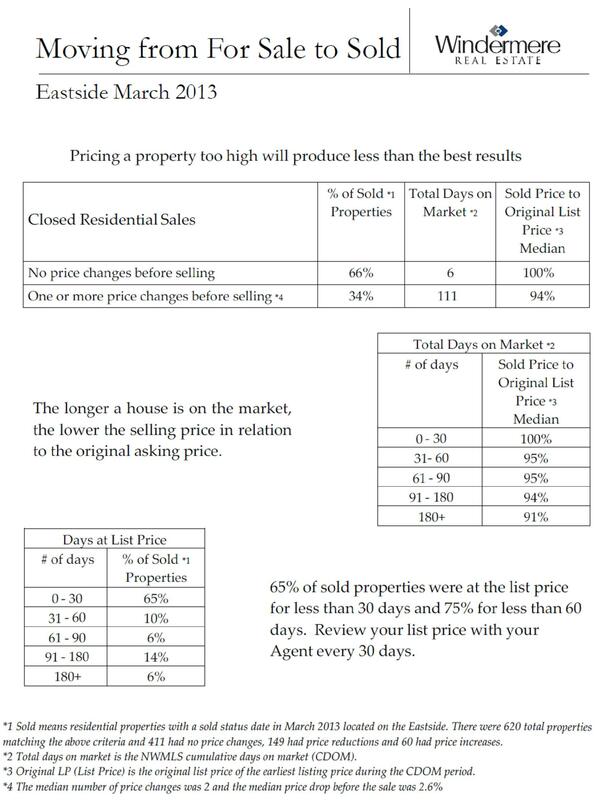 If you look at the second chart, you can see for every 30 day period a home is on the market, the selling price drops. Homes that were on market for a long time were the homes in which sellers could bargain with the buyers, but it usually meant the price dropped. Buyers think a home is overpriced or there’s something wrong with it if the house is on the market for more than a month in this market. If you decide to sell your home, you’ll need to decide in which half of the market you’d like to be. 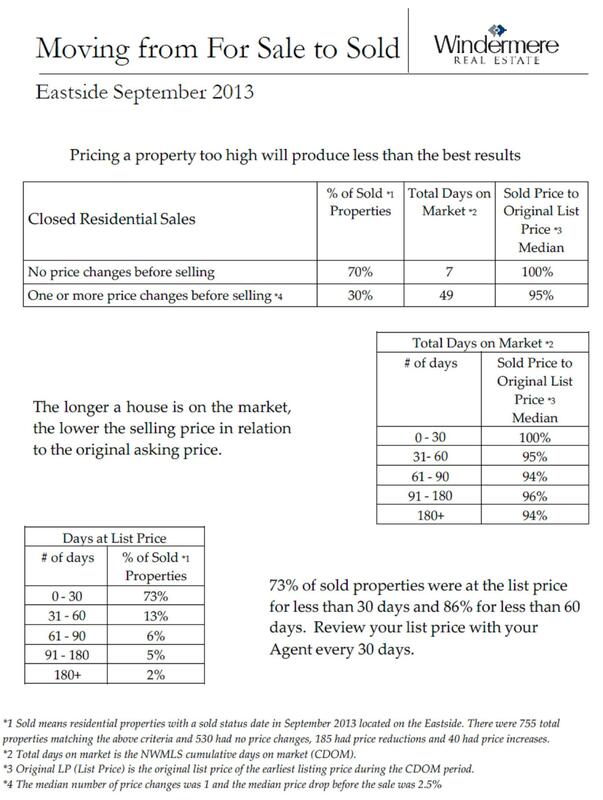 Do you want to be in the market in which your home could sell quickly and for a good price or do you want to test the waters, take your time, and more than likely sell for less? It’s your decision.